How are personality traits – such as optimism, sensation seeking or need for cognition – "encoded" in the brain? Do people with different levels of, say, extraversion have different neuronal structures? Or do they have different amounts of certain neurochemicals, different numbers of receptors, or other kinds of functional differences? So if you want to change a trait, can you simply stimulate or supplement neuronal functionality, e.g. by administering the lacking neurochemicals, or do you have to "destroy" and "rebuild" the neuronal structure, e.g. through learning? RESULTS: Overall, introversion was associated with increased blood flow in the frontal lobes and in the anterior thalamus. Regions in the anterior cingulate gyrus, the temporal lobes, and the posterior thalamus were found to be correlated with extraversion. CONCLUSIONS: The findings of the study lend support to the notion that introversion is associated with increased activity in frontal lobe regions. 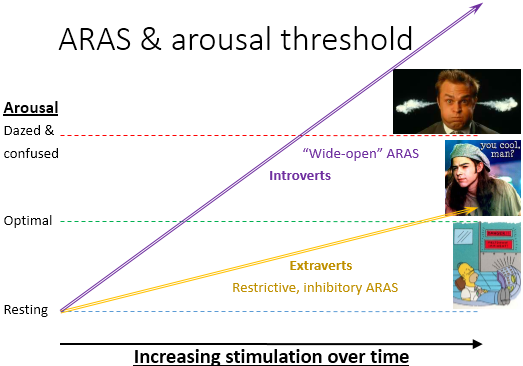 Moreover, the study suggests that individual differences in introversion and extraversion are related to differences in a fronto-striato-thalamic circuit. In an earlier answer today (to What makes a sight or an image mesmerizing and irresistible? ), I implied that sensation-seeking relates to the behavioral activation system, the nucleus accumbens and VTA, and dopamine. Support for those relationships ought to be available through Wikipedia. Activity has been correlated to negative emotionality via fMRI. Cooperative people show more activity during social interaction, implicating reward sensitivity. Aversive attention and motivation is right lateralized; approach motivation and aversion inhibition is left lateralized. Transcranial magnetic stimulation (TMS) knocks out self-enhancement bias temporarily. Damage reduces emotional experience, regulation, and inhibition – cf. Phineas Gage, Capgras syndrome, and the history of frontal lobotomies. Activated by unexpected emotional conflict – stronger in neurotics viewing conflicting cues. Electrode stimulation of substantia nigra $\rightarrow$ depression! Testosterone affects aggression, competitiveness, sexual motivation, sensation-seeking, risk aversion, empathy, and abstract reasoning. See "Are there recent theories on physiognomy?" and "What are the cognitive effects of increasing testosterone levels in men?" Monoamine oxidase A affects maladaptive vulnerability to stress resulting in antisocial behavior. Mu-opioid receptors relate to collectivism and pain sensitivity. Serotonin also relates to collectivism and anxiety. See "Innate personality tests: do they exist? If not, why?" Judging from effects of TMS (and tDCS), intelligence may relate to cortical excitability and myelination – see "Can learning be facilitated by transcranial magnetic stimulation?" As for changing personality in general, neuroplasticity may be important to consider, but biofeedback may be able to take advantage of it to alter neuroticism – see "Neuroplasticity and Treatment of Depression". Chronic malnutrition might even affect neuroticism by deeper mechanisms than subjective stress resulting directly from deprivation – see "The effect of proper food intake on emotions and brain function". Other links seem to exist between physical and mental well-being – see "Does mental satisfaction lead to physical satisfaction?" – but I'm probably getting further afield here than you intended answers to go. - Johnson, D. L., Wiebe, J. S., Gold, S. M., Andreasen, N. C., Hichwa, R. D., Watkins, G. L., & Ponto, L. L. B. (1999). Cerebral blood flow and personality: A positron emission tomography study. American Journal of Psychiatry, 156(2), 252–257. Retrieved from http://journals.psychiatryonline.org/article.aspx?articleid=173270. Personality studies are typically investigated via the "big five" traits. Some attempts to legitimize the personality traits through biology have been pursued . Following are some excerpts from a particular study that proposed a hypothesis and searched for confirmation in 116 subjects. Of course, this means we should be wary of confirmation bias when interpreting the results. Interestingly another investigation framed the question as "personality influences on brain reactivity" . I personally find this backwards. I think personality is an ermegent property of brain (coupled with environmental influences and social roles, of course). The authors predict mechanisms for personality traits depend on sensitivity and efficiency of processing circuits. So, for instance, someone may be more neurotic because their circuits that detect dangers and threats have a lower threshold for detection. Detection threshold play an important role because no detection system is perfect; for a sufficiently complex detection process, you have to set your threshold to bias either towards false positive or false negatives. If you were in the military or medical profession, you'd likely want to to learn more towards false negatives because you'd rather spend time on an innocent/benign than let a guilty/malignant through. Whereas, if your in business and going for efficiency, you might lean towards false positives and go ahead and sell the customer malfunctioning goods and hope only half of them want a return (as long as your customer isn't military or medical). So a neurotic person could be said to have a detection system that leans further towards false positives than the "neurotypical" person. Extraversion was associated with the volume of medial orbitofrontal cortex. This region is involved in coding the reward values of stimuli, and has therefore been hypothesized to be a substrate of Extraversion (Depue & Collins, 1999), which appears to reflect sensitivity to reward. Increased volume of orbitofrontal cortex has been associated with Extraversion in two other studies (Omura, Constable, & Canli, 2005; Rauch et al., 2005), and our study provides further evidence for this association. Neuroticism was associated with reduced volume in dorsomedial PFC and a segment of left medial temporal lobe including posterior hippocampus, and with increased volume in the mid-cingulate gyrus, including both gray and white matter. These associations are consistent with the theory that Neuroticism represents the primary manifestation in personality of sensitivity to threat and punishment, encompassing traits that involve negative emotion and emotional dysregulation. Agreeableness was associated with reduced volume in posterior left superior temporal sulcus and with increased volume in posterior cingulate cortex. The superior temporal sulcus is involved in the interpretation of other individuals’ actions and intentions on the basis of biological motion (Pelphrey & Morris, 2006), a process that may be more efficient in individuals who score higher in Agreeableness. DeYoung, C. G., Hirsh, J. B., Shane, M. S., Papademetris, X., Rajeevan, N., & Gray, J. R. (2010). Testing predictions from personality neuroscience brain structure and the big five. Psychological Science, 21(6), 820-828. Canli, T., Zhao, Z., Desmond, J. E., Kang, E., Gross, J., & Gabrieli, J. D. (2001). An fMRI study of personality influences on brain reactivity to emotional stimuli. Behavioral neuroscience, 115(1), 33. On a totally personal basis.. The above link should be a great start for you! The biological basis of personality is the theory that personality is influenced by the biology of the brain. Though closely related to personality psychology, the biological basis of personality focuses on why or how personality traits manifest through biology, in addition to identifying personality traits. This is investigated by correlating personality traits with scientific data from experimental methods such as brain imaging and molecular genetics. But as far as the optimism thing goes, increasing Serotonin levels might be the way to go.. The above is a helpful article on how to increase the Serotonin levels in your brain without the use of drugs. Lower platelet serotonin receptor function was associated with lower mood in one study, whereas better mood was associated with higher blood serotonin levels in another. Two studies found that greater prolactin release in response to fenfluramine was associated with more positive mood. Hope this helps and good luck with your research!! What makes a sight or an image mesmerizing and irresistible?